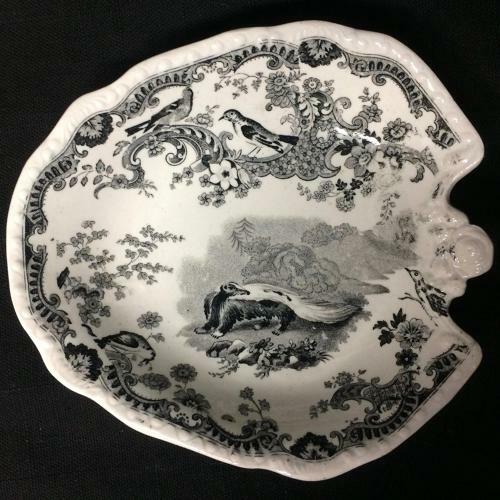 This is a stunning black Staffordshire transferware pickle or condiment server, c. 1820 measuring 5 1/2” x 5 ” in diameter was impeccably potted and finely transfer printed in a rich bittersweet black with pearlware glaze, gadrooned edge and scalloped rim. The central image depicts a skunk created with the pen of a natural historian. The bold border and background features exotic birds along with lavish flowers. An absolutely stunning composition. The piece was made by Job Meigh and Sons, c. 1820, in the Staffordshire region of England, as part of the elusive the Zoological Sketches series. According to the Transferware Collector's Club source print database, the image may have originated in the book "A Cabinet of Quadrupeds" by Peter Jackson, Fisher & Son, St. Martin's-Le-Grand, London dated 1796. This pattern is part of a large series that depicts different quadrupeds and animals on each size and shape. The engraved source prints were also used by Enoch Woods, Ralph Hall and Copeland & Garrett in other transferware zoological series. Never used and very clean.